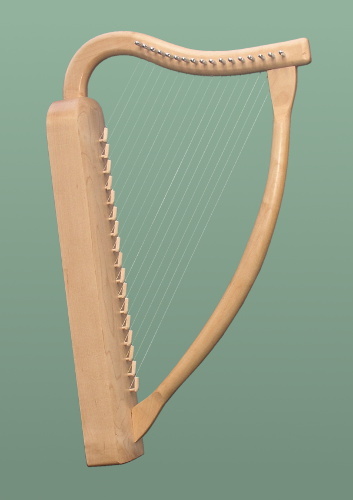 The Diabolus Lap Harp is based on a number of early medieval carvings and illustrations which show a small, easily portable harp. The body is carved from a single piece of maple. It has 17 strings, which gives a useful diatonic range of just over two octaves, from a to c'' (although other tunings are possible). Like most medieval and renaissance harps, it has brays. These give a buzzing sound which is characteristic of early harps. They can be finely adjusted to give just the right amount of buzz, or if you prefer a modern sound, they can be "turned off" by turning them sideways. I normally fit nylon strings, but natural gut or NylGut can be supplied at extra cost. Medival Lap Harp, 17 nylon strings. Includes tuning key.